It was this time last year that the work of Master Penman Jake Weidmann was displayed in every Apple store worldwide. Though we had been working closely with Apple for months in advance, we were still in total amazement to see the fruition of his work all lit up and magnified for millions to see. In promotion of the iPad Pro and introduction of the Apple Pencil, Jake and I were contacted at the end of summer 2015. One email, a few signed papers and 20 minutes of conversation later, Jake and I were on our way to Apple headquarters. 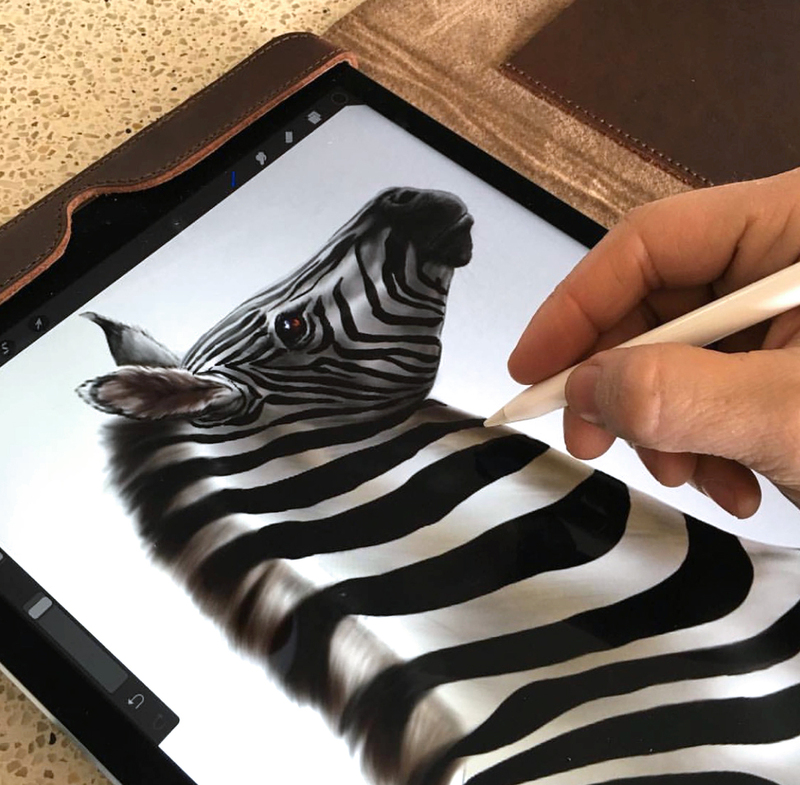 The scope of the project involved five other artists from around the world to test out the iPad Pro and the brand new Apple Pencil. In the end, only some of the artists would be featured in the Apple commercial and even fewer invited back for demo purposes at the 2015 Keynote to be held in San Francisco. Apple employees were more than honest in telling Jake they were not totally confident that he would take well to the technological world. We laughed because we knew they had a valid point: my Renaissance man isn’t so tech-savvy as he steeps himself in time-tested rituals surrounding his work. But ultimately, the connection was stunning as Jake's old world techniques translated seamlessly into the digital realm. Jake did indeed “pass” Apple’s expectations and was featured in the Apple Pencil commercial (see below), and was even asked back to the 2015 Keynote where a demo booth was set up for specifically for him (right). The connection was so seamless, in fact, that Jake was asked to partake in Apple’s holiday promo to be featured in Apple stores worldwide. (See the reindeer images above.) He went from being the speculated artist to Apple’s go-to artist for several projects in the coming months. The process, for those of us behind the scenes, was just as beautiful as the end result, if not more so. Jake worked closely with the developers of an app called ProCreate, which was intergraded into the creation process for all of the artists included in the project. It was with these developers that Jake helped tweak the Apple Pencil calligraphy feature. The calligraphy pen within the app resembled broad edge strokes, Jake told them. When he explained the need for pointed pen features to create his signature style work, the developers sat down with Jake as he pulled out his calligraphy pen and ink, demonstrating the splay and flexibility of the nib to create shades and hairlines. After the Apple developers had their turn to play with Jake's old world tools, they changed the initial parameters based on their experience and Jake's expertise. Within minutes, Jake reviewed the new and improved features and laughed with amazement. Aside from writing with true pen and ink, he said the results matched very closely with his trusted tools. From the texture of the “paper” and strokes of the pen, the experience became more real and inviting to Jake than he would’ve expected. Though Jake will never produce a final piece from digital medium, both the iPad Pro and Apple Pencil have become valuable tools in his artistic tool belt. We are excited that modern technology is looking toward the past for inspiration and knowledge of how it can improve. “We need to stop putting technology and handwriting in opposing corners,” as My Artist would say, and soon realize that they both have much to offer one another. Jake and Hannah Weidmann are husband and wife whose life together started with a letter written in Spencerian script and sealed with wax. With a life surrounded by art and a love for the written word, Hannah finds herself running the ins and outs of their fine art business as co-owner and executive director. From fulfilling orders to communicating with international museums, Hannah is also a writer by profession and passion. Jake and Hannah find their gifts complementary both in marriage and business as they live by the phrase: "Alone we perish, together we flourish."